Of all my 7 steps to a healthier home, getting rid of trans fat is the easiest one. Word has gotten out that no amount of trans fat (aka partially hydrogenated oils) is good for you, and food manufacturers have replaced the margarine with other oils. Much of the Orthodox community, however, lags behind. Many families cook with margarine, and many of the bakeries use shortening. Heimishe brands–even their whole wheat products–use it in their snacks and candies. The good news is that eliminating trans fat simply means reading labels. Just don’t be fooled by the “0g Trans Fat” marketing slogan on the front of the box, because even these products contain partially hydrogenated oils (just not enough to be listed). For nearly every product with trans fat, there’s an alternative brand without it. I’ve never seen trans fat in any Trader Joe’s products, and they are often cheaper than similar products at the grocery. And as for margarine? We use oils, butter, coconut oil instead. Following is our current favorite dessert, with only 2T of coconut oil. They’re by no means healthy, but a little bit satisfies my kids, rather than eating loads of margarine-filled cookies. You can find coconut oil at most groceries in the health food aisle, Target and Whole Foods. They’re so easy to make that my 7 year old made the batch pictured here. Melt the chocolate and coconut butter in a double boiler or a pot over a low flame, stirring constantly. Mix together the nut butter and honey. Pour a layer of chocolate into each muffin tin. 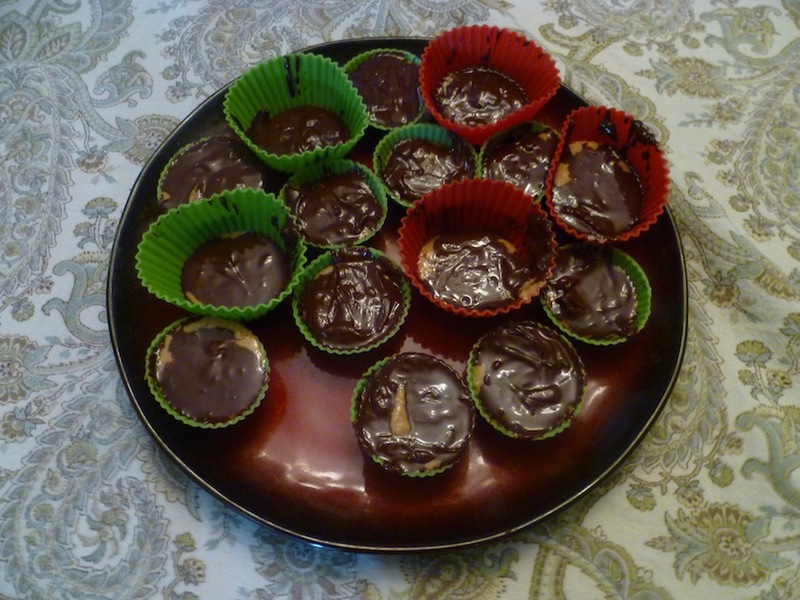 Add a dollop of nut butter mixture to each cup and then cover completely with chocolate. Let cool in the fridge for at least 1/2 hour.